It should open in your browser, from where you can save it to your hard drive. Alternatively, right click the link and choose “Save as” or “Save link as”. An interesting article about Moyra, written from an unique perspective, has been posted by Roger Jones, the founder of Ex Libris Books in Bradford on Avon. Moyra Caldecott’s children have recently finished moving Moyra into the Woodland Grove Care Home in Bath, and selling her house in Southdown. Her possessions have been distributed, many of them brought to the Home where she is living comfortably surrounded by her favourite objects and artefacts – books, paintings, blown glass, geological exhibits, and so on. At the age of 87, being unable now to speak or write, construct sentences or find words, she is limited in what she can do. Nevertheless she seems quite happy, and her children visit when they can. Julian is closest, since he lives in Bath. Rachel lives in southern France. Stratford, the eldest, lives in Oxford, but is hampered by prostate cancer which he has been fighting for three years. We plan to post here information about Moyra’s interests and any relevant activities of her children. This site should be a way to continue Moyra’s presence on the Web. Her numerous published books, most of them remaining in print thanks to the work of Mushroom Publishing, are a stimulus to read as she would read. She was fascinated by folklore and mythology, art, history, and cosmology. Those subjects and others will be followed here on the Moyra Caldecott web pages. We hope you drop by from time to time! taken the day after my husband died. A house reflected in the canal. I went often to the canal after that. and blazing windows in the reflection. The heavy brass doors shut. against the pillrs of the vestibule. The gods are sending out the bills and we can’t pay. it was a false invenstment. It seems Edgar Cayce, the famous psychic and healer of Virginia Beach, Florida, predicted that Atlantis would be discovered in 1968. In a series of explorations that began in 1968 Dr Ray Brown, a professional diver, discovered what he was convinced was an underwater Atlantean city in the area popularly called The Bermuda Triangle – an area where there seem to have been an extraordinary number of mysterious happenings this century. Not far from Bimini he and his crew were searching for sunken Spanish galleons in the hope of finding treasure. Immensely strong magnetic readings were registered in the area. Nothing was found on that occasion, but Ray Brown was not satisfied and returned with a fresh crew. This time an accident occurred and Dr Brown experienced death. He describes feeling shock at the blow to his head from the propeller of a fishing boat, followed by a deep sense of relaxation and peace. He felt himself expanding until he not only encompassed the whole world sphere, but the universe as well. He was dragged out of the water and pronounced dead. Suddenly he felt the life-force returning and jerked as though experiencing an electric shock. Two weeks later he set off for the same area with four new divers. They were caught up in an enormously powerful tropical storm – a storm which not only damaged their boat but stirred up the sand on the sea bed. It was thus that they found the remains of a huge underwater city. Excitedly they explored it. At one point Brown, who was separated from the others, looked up and was dazzled by the beams of sunlight breaking through the water on to a gigantic pyramid apparently made of highly polished stone – so highly polished indeed that it resembled a mirror. On closer examination he found it was made of a blue stone that resembled lapis lazuli. He swam round and round it in amazement and on the third pass noticed an opening and swam through it. He found himself in a rectangular chamber with a peaked ceiling (rather like the chamber in the Pyramid of Kephren at Giza, Egypt, I assume). From this ceiling “a two inch diameter gold-coloured metallic rod hung straight downward, and beneath it was a pedestal, on which were metallic hands directed upward. In their grasp rested a perfectly formed crystal sphere. Around the pedestal were seven very large stone chairs.” Brown’s air supply was running out and he knew he had very little time. He tried to dislodge the golden rod but could not. He managed, however, to take possession of the crystal sphere. It seemed to him at that moment he felt an ominous presence in the chamber and heard a voice telling him to leave and never return. He hurried back to the surface with his prize and, according to the article I read, has it still. It has tremendous energy. Dr Brown has become a healer and uses the crystal in his work. Heeding the warning he never returned to the place where he had found it, but sadly, the four divers who were with him did. All four were drowned. Brown says that no more tragic and mysterious disappearances have occurred in the Bermuda Triangle since the removal of the crystal. So many experiences connected with the Bermuda Triangle and Atlantis are told these days that one does not know what to believe, or rather, on what level they are to be accepted as reality. All this may well have happened – literally – and Dr Brown may indeed have a crystal in his possession that came from ancient Atlantis. But whether it did or not – whether Dr Brown was suffering from delusions caused by lack of oxygen or not – the story he tells is rich in mythological significance and as such has a reality we would do well to accept. He is swimming in the ocean of consciousness. He is dazzled by blinding light (like Saul on the way to Damascus). He sees a pyramid the shape of which, as the ancient Egyptians very well knew, draws one’s awareness away from the “four-square” world and points it towards the heavens. The pyramid is blue like lapis lazuli – the most sacred stone of the ancient Egyptians, brought all the way from the Afghan mountains and used in their sacred images for the eyes of the gods. It is shining like a mirror – the mirror in which one faces oneself – one’s Self. He swims round three times – the classic number of initiation. He enters through darkness into the light interior of a sacred space. The gold bar from the ceiling is conducting the energy from the highest source of spirit to the earth, where the transformer, the crystal sphere, is waiting to receive it. 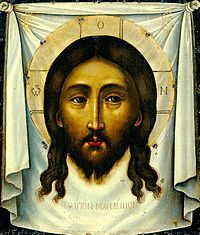 Note that the process started by his looking for treasure in the worldly sense, and ended with his finding treasure in the spiritual sense: the capacity to heal. Seven chairs are around the crystal. Seven Adepts or Masters must have sat there in the ancient days transmitting the energy to the world. Seven is a number redolent with mythic power. That they sat in chairs suggests that they were in a relaxed state of meditation. They were not frantically working knobs and dials and pushing buttons. The energy was passing through their bodies and in the process becoming safer for humans to use. Brown himself uses the crystal with the energy of his own body, and so the energy transmitted is limited to what his own body can contain and pass on. If he had succeeded in taking away with him the whole Atlantean apparatus without the control of the seven Magi, who knows how much damage he might have done. Like all sacred knowledge it is guarded against misuse. Those who are not ready for it may not have it. He is warned not to return, and those who do are drowned. A journal called Spirals edited by Vivienne Verdon-Roe, 1978. Report on a talk by Dr Ray Brown given at the Clearlight Foundation Conference, December 1977.
of what you did not know you knew. Did you ever really know him? Before I leave this section another thought has come to mind in connection with those fairy tales. I don’t understand Einstein’s theories but I have been told that he suggested that if you faster than the speed of light, time slows down, so you don’t age as fast as those you left behind on earth. Now there is an important point I want to make, and perhaps I should have made it at the beginning of this talk instead of at the end. When I was researching my Egyptian novels I came across the concepts of ‘Everlasting’ and ‘eternity’ set over against each other. When I was young I had always associated them together, believing that they were the same thing. For instance in a Grimm brothers story I read about a diamond mountain in Pomerania which was two miles high. Every 1000 years a little bird came and sharpened its beak on it. When the diamond mountain is worn away, the story said, this would indicate that the first second of eternity had been passed. In Irish myth I read that the Otherworld was remarkably like our own – but better. Its brightness like that of gold. Whose crowns are meetings that do not meet. In the corner of each mantle. Even in the Bible I read a description of the otherworld using images from this and implying in both cases that That is just an extension of This. And he that sat was to look upon like a jasper and a sardine-stone: and there was a rainbow round about the throne, I sight like unto an emerald. And round about the throne were four and twenty seats: upon the seats I saw four and twenty elders sitting clothed in white raiment: and they had on their heads crowns of gold. 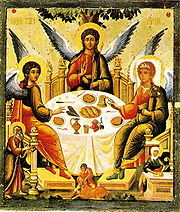 And out the throne proceeded lightnings and thunderings and voices: and there were seven lamps of fire burning before the throne, which are the seven Spirits of God. In this century T.S.Eliot’s poem Little Gidding comes to mind. When my husband died I avoided asking him for help because I feared it would impede his progress in the Otherworld – might take him away from doing something else more important. And then I got a message ‘loud and clear’ reminding me that in the Otherworld there is neither time nor space. He does not have to come from somewhere else to attend to me – because he is ‘here’. Because we call it the Otherworld we think it is like this one – only insubstantial. It is totally, unimaginably different. For the first time I understood how God could be aware of every sparrow that fell. ‘He’ wasn’t somewhere else looking on as we would from a height surveying a landscape. The sparrow is ‘in’ Eternity with Him. And we, if we were not seduced by others into confusing ‘Everlasting’ and ‘Eternity’, would know that we, as eternal spiritual beings, are ‘in’ Eternity even now, while we are simultaneously but only temporarily ‘in’ time because we have material bodies as well as our spiritual being. If we had champagne this evening I would ask you to raise you glasses in a toast to the magnificence of the present moment, through which all the strands of multi-dimensional time are threaded! As far as I understand it the Aborigine Dream Time is at once a mythic representation of the origins of their culture, set in the ancient past, and a state of heightened being they can slip in to the present in which their actions take on a deeply spiritual meaning. In other words it is another kind of Time, very different from Linear. The Rainbow Snake created the landscape in the ancient days as he gouged out valleys and water holes, but he is still present as a mysterious force that shapes lives. Similarly the human exists at once in the Dream Time and in the present. At once in Eternity, and in Time. Wally Camana in his book on Aboriginal Art says: ‘The Dreaming and the Dreamtime do not refer to the state of dreams and unreality, but rather to a state of reality beyond the mundane.’ James G. Cowen in The Elements of Aboriginal Tradition says: ‘The Dreaming embodies both an historical perspective and an account of First Causes. For it is in the activities of the ancestral beings in their various acts of world creation “outside time” that the Aborigine identifies with when it comes to determining how he should live’ (p. 23). ‘The Dreaming is, first and foremost, a metaphysical condition denoting the working of divine principles dressed up in the garb of totemic heroes. The myth is the expressive vehicle. Men identify with their Sky Heroes by way of ritual. The great ceremonies central to every tribe act as a channel by which Dreaming events are recalled, contemplated and acted upon in the life of the people’ (p. 24). The Dreaming is universal, though it has different names in different cultures – and it never means ‘dreaming’ in the ordinary sense of the word, but in the extraordinary sense. It ‘remakes’ our experience with significant symbolism into something more meaningful than we originally thought. Another very important group of categories I would like to mention this evening is what I will call The Mythic or The Spiritual. I have written several books about the esoteric meaning of myths, legends and fairy tails, and so when I label this category MYTHIC I do not mean it to be filed in your minds under ‘fiction’ or ‘fantasy’ or ‘just imagination’! To me the imagination is one of the most important faculties of the human mind. I hate the phrase ‘just imagination’. Imagination is the bridge between the Known and the Unknown. It flashes with images, metaphors and symbols that illuminate the deepest and darkest secrets of Being. ‘In the symbol proper…there is ever, more or less distinctly and directly, some embodiment and revelation of the Infinite, the Infinite is made to blend itself with the Finite, to stand visible, and as it were, attainable there’ (Thomas Carlyle, Sartor Resantus, p.152). Everything we do, everything we think, everything we are is influenced subliminally by the background mythical traditions of our culture and, beyond that, by the universal mythical traditions of the human race. Myths and legends are produced by the imagination when it is functioning at its most serious and profound level. The body is a finely tuned, immensely complex and efficient instrument capable of experiencing much more than we commonly give it credit for – and one of its functions is at once to house the ‘growing point’ for the soul, and to protect it from the damage it might suffer if it were exposed to too much transcendent experience too soon. The imagination tests out the ground beyond ourselves and allows us to explore the way ahead in imaginal symbolic form before we have to encounter it in reality. The imagination gives us myths and legends – those marvellous, subtle, complex vehicles of esoteric teaching – to prepare us for our future. In seeking their meaning we are meant to find the meaning of ourselves. Life is, as you well know, inexplicable. All the religions in the world, all the myths and legends in the world, all the scientific theories and mathematical formulae, laid end to end, cannot give us a glimpse, a fleeting flash, of something that makes us feel we understand so that we can live out our lives with direction and purpose instead of floundering blindly in the dust and wasting our potential. When we talk about the spirit, our ordinary language is inadequate, because we don’t know exactly what the spirit is. When we see leaves moving on a tree we assume the possible existence of a breeze, and even so do we assume the existence of spirit because of certain otherwise inexplicable experiences in our lives. The language we use when we attempt to talk about spirit is of necessity highly symbolic. A myth clothes those deep and mysterious insights into the meaning of life that we all have but sometimes refuse to recognise. Mythic truth is the language of the inner journey, and it cannot be judged by the same criteria we use in a court of law or in a laboratory. It has to sound true against our hearts. It has to fall into place like a ball rolling into the hole that was designed for it. Myths are among the greatest treasures of the world. Through the ages certain stories have evolved that are so universal in their appeal and so exactly fit human experience at the deepest level that they help us to cope with what would otherwise be the chaotic and terrifying impact of the outside world. When scientific and rational knowledge broke away from intuitive and instinctive knowledge these stories – these myths and legends – were dismissed as nonsense and relegated to children. In the households of very rational people, even children were denied their aid. Lately, having discovered that the route these scientists and rationalists insisted we take has led us into an horrifying impasse, and following such great thinkers as Jung and Joseph Campbell, we are trying to reinstate the ancient myths, the healing stories, to their rightful place complementing and illuminating the other types of knowledge available to us. Story is a natural need, and if we deny ourselves its benefits we may well suffer all kinds of maladies. In this section I would place the significant Inner Journey, the Dream Time of the Aborigines, and the Vision Quests of the Native Americans, the Grail Quest, and myths of abduction into other worlds. Although this evening I am talking about different types of time – of course I know that there are no clear categories in real life. What I call Linear Time runs into Physical Time, and Physical Time runs into Psychological Time, not to mention Dream and Memory Time. That is why I use the term ‘multi-dimensional’, because although they are different and have their own characteristics and influences, they happen to us simultaneously; they are part of the ‘wholeness’ of our experience. Under the heading of Psychic Time I would include experiences of psychometry, pre-cognition and automatic writing. An example of psychometry from my own life occurred when I was given a photograph in a closed envelope and told to hold it and try to ‘see’ it and report what I saw. I described a small impish boy with a cap looking rather like a street urchin at the time of Dickens. My friend showed me the photograph. It was of an elderly lady in black satin sitting at a writing desk. Then, with a smile, he showed me a sketch of the boy I had seen. It seemed he was the spirit guide of the medium in the photograph. So I had ‘scored’ after all. On another occasion I held a stranger’s locket and got an overwhelming felling of suicide. It turned out to have been given to her by her lover at Masada in the Middle East, a place made famous by the suicide of hundreds of Jews during the siege by the Romans in 73AD. Pre-cognition, premonition and prophecy have always bothered me because I don’t like to think we have no free will – that everything is ordained and pre-determined. When I try to accommodate it in my thinking I come up with the image of a football match, the rules of which, and the roles of each of the players, are pre-determined, but the outcome is still uncertain because it is dependant on the free will actions of the players within the given framework. I have one case of prophecy to report from my own life. At the age of eighteen some friends and I were experimenting with a Ouija board to contact the dead. We became quite carried away by it, as it seemed to be giving us remarkably relevant and accurate answers to our questions. So relevant and accurate indeed that we became frightened and decided to stop. At our last session one of my friends was told that she would die at twenty-seven, and I would die at thirty-five. When she twenty-seven she did die! So when I reached thirty-five I was very uneasy, even to the point of not wanting to fly because I was convinced the plane would crash. My sensible, sceptical husband talked me out of it and I went on the flight. It did not crash. In fact, as you can see, I am still alive. Did my friend bring about her own death because she believed the prophecy? Certainly African witch-doctors and West Indian Voodoo practitioners can bring about death by fear. Something in my own life changed considerably when I was thirty-five. So, in a sense, the ‘old’ me did die then. Was the prediction was correct – but merely misinterpreted? If prophets and prophecies exist we have to be careful, remembering the witches in Macbeth who make two correct predictions and thus arouse expectation in Macbeth that their third will also be correct. He brings about the third by his own efforts. ‘Automatic writing’ I think also come into the category of Psychic Time. As it is usually understood, a person can be ‘overshadowed’ by a spirit from the Otherworld to write or draw or compose music. There have been some well documented cases of famous artists, writers or composers ‘coming back from the dead’ to finish unfinished business this way. An experience of this type of my own occurred one morning when I woke from a deep sleep. The person in my dream continued speaking while I was waking, and, without realising what I was doing I wrote down what he was saying. When I read it through at the end, it made profound sense. Unfortunately when I was awake I could not remember who the person was, though in my dream I knew exactly who he was. Atman was given the secret of the universe as a gift. He was pleased, but he didn’t know what to do with it. At first he tested it in all kinds of ways to find out what it was, but failing to get a satisfactory answer he hung it on a tree as decoration. And then he forgot it. So it stayed for a long time… an unconsidered trifle… until one day someone came by who recognised it and asked if he might have it. Atman gladly parted with it in exchange for an artefact and went off satisfied that he had struck a good bargain, rejoicing in his newly acquired treasure. The one who now had the secret of the universe saw that it was a seed and planted it in his garden, rejoicing in its shade in the heat of the day and was filled with great reverence and love. All things were clear to him. Meanwhile Atman began to grow dissatisfied and miserable. The artefact no longer pleased him. He was bored with it. He had done whatever there was to be done with it on the first day and thereafter he could find out nothing new about it. The man who had the Secret of the Universe however was never bored, its variations were infinite, his interest in it ever deepening. At last Atman, having realised his mistake came to the man and asked for it back. But now the price was so high Atman could not pay it. At that moment the man standing under the Tree of Life reached out to him and gave him freely of its fruit. Leading on from this I would raise the vexed question of ‘ghosts’. There are so many reports of ghosts (and I myself once experienced one) that I am inclined to believe in them. But what they are I don’t know. Are they impressions of past lives left in a place rather like a video recording that was made and not quite wiped away – some technical hitch in the Akashic Records and the passing of Linear Time? Or are there indeed souls who were detached from their bodies at death and are still clinging to their old lives on earth instead of moving on through the many and complex realms of the Afterlife? I am sure we have all had gloomy, fearful impressions in a place, only to find out later that it was the site of a dreadful battle, or a horrific murder. If Linear Time is the only sort of Time we experience, how can we thus ‘tune in’ to events that have already past as though they are still present? We don’t know how it can be, but we have noticed that a strong emotional charge seems to be a necessary part of it (as with telepathy) and a certain kind of sensitivity is necessary to ‘pick them up’. Most of my books have sprung from similar experiences that could have been ‘far memory’. The Tower and the Emerald was written incorporating an experience I had at a stone circle in Derbyshire, where all the stones are lying down on the earth as though pushed down by a giant hand. There I felt that there was a body buried at the centre who had been cursed so that his soul could not leave that place, ever. He seemed to be pleading with me to release him – but I resisted because I thought he might have been pinned there for a good reason, that is, that he was under the influence of an extremely evil force. I walked away. But that night, and for four nights following, I had a recurring dream in which I was one of the priests that had cursed him and buried him. I saw that we broke both his legs so that he could not run away while we performed the ritual. I realised I would never be free of the dream unless I freed him. Besides – it seemed to me that on one had the right to deprive a soul of its freedom to repent and be redeemed. I went back to the circle and prayed that he would be released to the care of the Angel Gabriel and the Christ (as sort of celestial probation officers). The disturbing dreams ceased. Months later, a friend, to whom I had told the story, told me that she had visited a local museum and discovered that there had been a burial at the centre of the circle – and that the body had both legs broken. 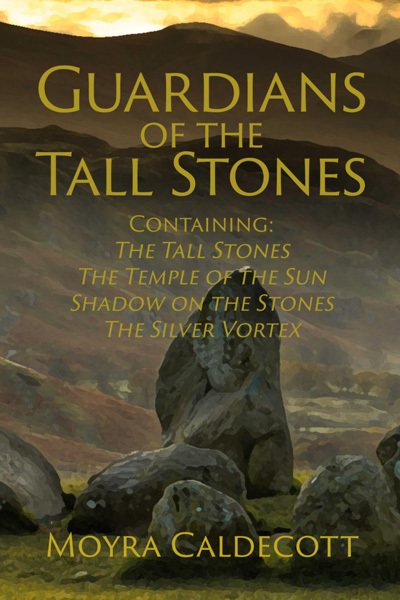 My most successful book, a trilogy of novels set in the Bronze Age of Britain, now in one volume called Guardians of the Tall Stones, still in print after 24 years, started off from an experience I had in a stone circle at Dyce, near Aberdeen, in Scotland. I had angina at the time and after several heart attacks was living for each moment very intensely and gratefully. I was only in the circle for a few moments, but felt I had experienced a life time there. I began to write – fast – determined to get it all down before I died. My main character was Kyra, a young girl who found she had psychic abilities and was therefore chosen to train as a priest in the Temple of the Sun, far to the south, at Avebury. In 1976 as I lay in St Thomas’s hospital in London after a severe heart attack, not believing that I would be alive in the morning, I watched a star through the huge plate glass windows slowly crossing the sky. I wrote the following as though it was happening to Kyra at Avebury, but to me it was at once my own experience that night in hospital and the experience I was ‘remembering’ from that ancient time. Linear Time had ceased to exist. On a clear, moonless and cloudless night, she entered the great Stone Circle of the Temple and lay upon her back on the grass, her feet towards the East where the Sun would rise. She was alone and the whole night was hers. This night she must not let her attention wander for an instant. The Star the High Priest had chosen for her was rising at the moment she lay down and she must watch its progress across the sky, unwaveringly the whole night long. No matter how tired her eyes became she must not let it out of her sight for an instant. The effect of the high earthen ridge around the Circumference was to cut out all sight of the landscape and the villages around. She was isolated in a Circle of Power in complete darkness, alone with the Stars. As the night progressed she totally forgot herself lying on the grass. All that existed was the one star she followed, brilliantly in focus, while an incredible pattern of subtly changing points of gold moved round in the background of her vision. The star she watched not only moved with slow but inexorable majesty across the dark forever hole of the night sky, but grew in brightness and in power until she felt it like a sharp needle point actually penetrating the centre of her forehead. It seemed to her the earth bank and the Tall Stones surrounding her not only kept the rest of the world out, but concentrated the power of the stars and whatever realms of Reality that lay beyond her normal consciousness, until they grew in strength and became the only Reality of which she was aware. Her mind ached with the strain of thoughts that were coming to her. Her forehead ached with the pain of the sharp beam passing through it. She felt very strange as she turned with the earth, feeling the earth move and the Star stand still. But the thought she was trying to grasp kept returning until at last her mind could encompass it. It was the realisation that the beam of force from the star that was passing through her and through the earth, and through the universe beyond, was returning to the Star of its origin from the other side! As though the Whole Universe was a sphere, yet of such a kind that there was no material solidity to it whatever, and therefore no bounds of inside and outside. She was like a bead on a necklace, threaded through the line of force that was curving with the Universe. As she grasped this there seemed to be a kind of brilliant explosion in her mind, or was it in the sky? But suddenly, from every star in the sky, there seemed to be the same fine beam of light, and each one was threaded through the pain in her forehead, through the earth, and through the Universe beyond and back again to its original Source. Did they start in her hear? She could no longer tell if she was the centre from which all the beams were coming, or whether she was the passive recipient of the beams from the stars. Was she the beginning of all things? She could not remember her name. But she had no name. The more she tried to remember the more the beams passing through her head hurt her. At last exhausted and in agony, she accepted that she had no name. And with that acceptance the pain ceased, and she lay in wonder, watching the cycles of light weaving their magnificent pattern all around her and through her. The beauty of it! The blissful peace and happiness she felt that anything could be so perfect occupied her for the rest of the night. And when the sun slowly rose and the vision faded, she remembered her name. And with the remembrance she moved and felt pain in every limb. Slowly she dragged herself to her feet and looked round her with weary and bewildered eyes. The dawn light revealed the Circle as she had known it before, the grassy bank, the giant Stones. Above her the first flights of birds called cheerfully to their fellows.